There was a traffic collision at 400 W. Civic Center Dr., at Ross, involving two vehicles, at around 6 p.m., according to local photographer Igmar Rodas. 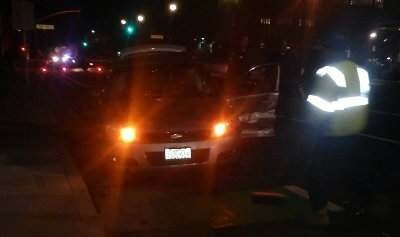 Two males in one of the cars fled the scene. 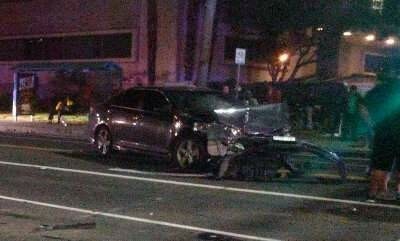 There was one woman driver in the other vehicle. She stayed at the scene. The suspect’s car. PIcture by Igmar Rodas. The suspects remain at large. A few homeless people chased them but they got away. Rodas reported just now that the suspect’s were driving a stolen car. The License Plate of the stolen vehicle is 7G0U515. The car was a grey Chevy. Reportedly they abandoned the car and the suspects fled on foot, northbound on Ross towards Washington.